Sergio Ramos was up to his usual tricks during the Madrid derby today, the Spaniard made sure that this would be a day to forget for Antoine Griezmann. Ramos’ goal this afternoon came at a pivotal moment in the match, Real Madrid’s captain converted from the spot after talented youngster Vinicius Junior won a penalty for Los Blancos. Ramos stepped up and the Spaniard looked cool, calm and collected before he slotted the ball past Jan Oblak. Of course scoring a penalty wasn’t enough for Ramos and the centre-back took this opportunity to mock Atletico’s Antoine Griezmann. 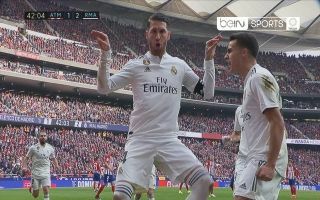 Ramos mimicked the star’s goal celebration, only Sergio Ramos is brave enough to mock one of the world’s most talented players in such a big game – which still had more than a half to be played. Its my captain Sergio Ramos.